While I liked my bedroom, I had just been wanting to change it up a bit.... and after losing my dog, decided it was time to do it! Dude slept on my bed most days, so my bedspread had been well washed! I am blaming TJ MAXX for everything I did! :) First I bought this awesome Tahari Home bedspread and then it just exploded, you know how it is .... One Thing Leads To Another! You know how TJ MAXX is if you see it in the store you better get it right then because chances are when you go back it will be gone! I was able to find two pillow shams to match so off I went! I had been wanting to stencil one wall in our bedroom, so this was the push I needed! 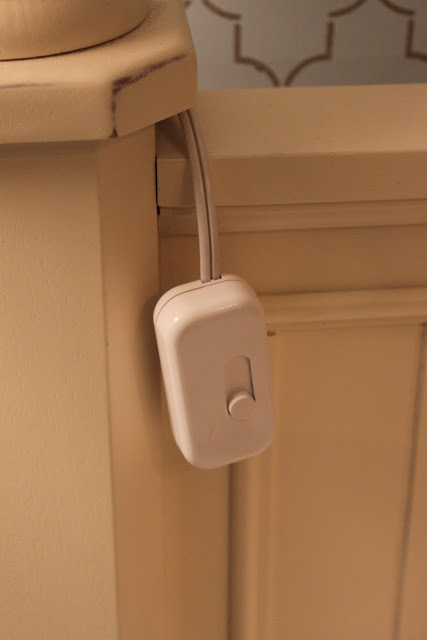 AND the best invention ever are these little dimmer switches from Lowes and around $15. each, we can now turn the lights out without knocking the lamps over!!! I used my sheer panels I had used before put them in the middle of the window and split the shower curtains in half lengthways and hemmed the one side. I then used metal ring that you just hook onto your drapes without making any holes! I am quite pleased how the drapes/curtains whatever you want to call them look! So without further rambling, here is the finished product! I guess I should do a tutorial on the Mr and Mrs signs I made ..... (one of my favorite things in the room) I found the rugs at TJ Maxx also! Hope you like it cause we love it!!! In case you forgot what it looked like before here is a shot below..... Two totally different looks.... I loved the first one below too.... but was ready for a change! How about you? What do you think?? Glad you like it Amanda!!!!! 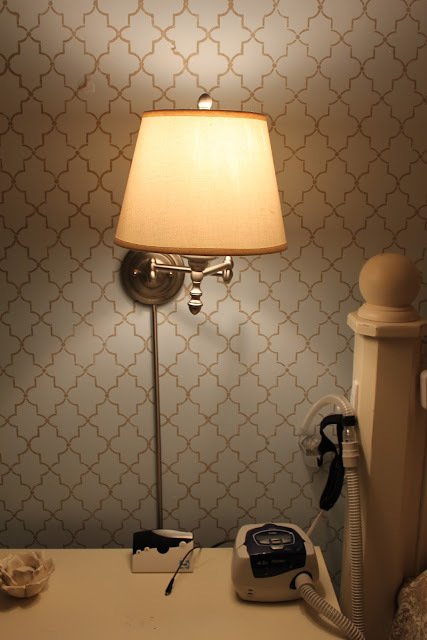 I just love your stenciled wall. It turned out amazing. Your room is so cozy and inviting just like you want your bedroom to feel. Great job. Hi Nancy, I'm visiting over from If It's Not Baroque. Wow! I really love this bedroom. It looks very calm and soothing. What a nice place to unwind! I love the wall mount lamps, we have some too. It really helps to free up space on the nightstand, doesn't it? And your stenciling looks amazing. Really, very well done! HI Debbie, Thanks for the compliments, we are loving the new look! The Wall Mounted Lamps really do free up some space!!! I like the newer look. It is really fresh & modern. Stopping by from Shabby Nest. Thanks Lisa I actually bought the stencil at Hobby Lobby! Hi Nancy. I am featuring your bedroom on my blog today. The next link party starts today in a few hours, I hope that you can link up again. Thanks.